Asian handicap betting can be one of the more complex betting types with bookmakers, but once understood correctly, offers great value for online punters. Asian handicap betting applies only to football games (soccer) and, in rare cases, field hockey. Online wagering has allowed punters to get a better understanding of this betting type, as well as making it easier to place a bet on football. 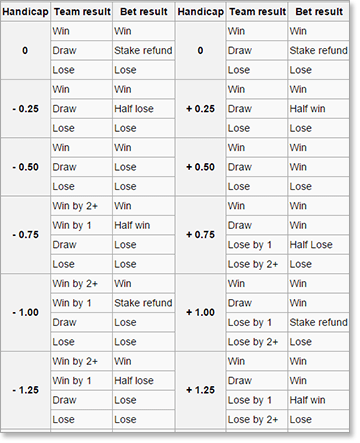 Asian handicap betting is when bookmakers offer a goal-start differential for football games, based on teams form. If Manchester United are heavily-favoured to win the game against Liverpool, the Asian handicap betting system allows punters to get better value with their selections, but they must either give up a certain amount of goals, or conversely get given a certain amount of goals. The 0.5 option is the easiest to understand, therefore we will use it as an example. In order for your Manchester United -0.5 bet to come in, Manchester must win the game outright. If the game results in a draw, then your bet loses. However, if you bet on Liverpool +0.5, then you have two of the three options covered. Liverpool can either win or draw for your bet to cash in, as the 0.5 gives them a slight goal advantage, enough for your bet to win. In order for your Manchester -1.5 bet to pay out, they must win by two goals. If you take Liverpool +1.5, Liverpool can either win, draw or lose by one goal and your bet will be a winner. This betting option is popular among football bettors because taking the team with the plus goal start effectively gives them three chances of winning. It’s the opposite for those backing the favourites – they are expected to win comfortably in the first place, hence the handicap. Asian handicaps can range from 0.5 to as much as 6.5 goals, but punters can choose a wide variety of options between those two options. Betting on these options eliminates the outcome of a draw – the most common deterrent for football punters. Therefore, betting on the handicaps is a good way to bet on the sport without the worry of those pesky draws. You might be asking – what if I take Manchester United -1 and they win by one goal? Well, that would result in a draw, but instead of losing your bet, it becomes a “push”. A “push” is where your bet is refunded as there was no clear winner. Pushing is considered a common result in other sports where handicaps are used including basketball, baseball, rugby, and many punters will alter their points starts to ensure themselves at chance at scoring the push and getting refunded. Some matches will be handicapped -0.5 or -2.5. In that case, there can be no pushes, as neither team can score in quarter or half goals. Therefore, quarter handicaps are split between the two closest half-intervals. For example, a $100 bet with a handicap of 1.75 is the same as betting $50 at 1.5 and $50 at 2. The bet would look as follows: Manchester United -1.75 & -2 vs. Liverpool. One half goes on -1.75 and the other half goes on -2. Simply add the scoreline from the match to the handicap bet you placed. So if Manchester United draw or lose the match, your bet loses. If Manchester United win by two goals you lose half your stake, and your other half is pushed (refunded). If Manchester win by three goals, both bets win. If you back Liverpool +1.75 & +2 and they lose by two goals, you lose half your stake and get refunded for your +2 bet. If they lose by one goal, both bets win. What are the best markets to bet on and what they do they pay? The best markets to bet on are those where you’re unsure whether a team will win or not. If you think Manchester United are going to win, but you’re not confident, simply take Manchester United +0 and you take out the option of the draw. This bet type is commonly known as the ‘Draw No Bet’ option with some bookmakers. There are some instances where teams will be heavily favoured. The teams that are paying $1.10 to win are almost unbackable on the head-to-head market, but if you think they will win comfortably, then the Asian handicap market allows you to make your own handicap line. The odds for the Asian handicap lines change depending on the game. Most bookmakers will try to keep the books even, by this they will offer handicaps that reflect how they think the game will pan out. Commonly, odds for both teams will be in the $1.80-$2 region, with some exceptions based on market support. Asian handicap live betting works exactly the same as normal live betting. Bookmakers will adjust their markets according to the circumstances of the game. The best way to play live betting is to make a bet prior to the game, and wait for the opportunity to “cash out” in live betting. Cashing out is like hedging your bets to secure a profit. If you take Manchester United to win by 2.5 goals, and the live betting market has Liverpool +3.5 at $2.10, then you can lock in your profit without worrying about the result – this is often called Arbitrage Betting.